Jakarta Governor, Anies Baswedan inaugurates Jakarta Investment Center (JIC) at Public Service Mall, Kuningan, South Jakarta.
" Jakarta Investment Center is officially opened"
This service is hoped to increase investment value in Jakarta. "Jakarta Investment Center is officially opened. Hopefully this service can improve investment performance and becomes a new start for business activity in Jakarta," he conveyed on the location, Tuesday (7/31). In that chance, he admitted wants Jakarta to be able to compete with other big cities in the world. Thus he wants his subordinates to prioritize service in JIC, especially towards investors. He also reminds JIC personnel not to work passively. They must be active in solving all problems. "This will be a place where people are coming to invest. Personnel must listen their needs carefully and resolve problems that can hinder investment," he affirmed. 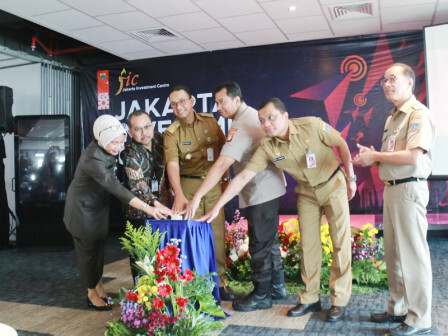 Jakarta Investment and One-Stop Integrated Service (PMPTSP) Dept. Head, Edy Junaedi explained, JIC will be the meeting center of all investors in Jakarta. This service provides several facilities such as business lounge and Jakarta virtual consultant for business. "It provides complete information to investors or potential investors who are planning to invest in Jakarta," he added. He mentioned, previous investment value achievement in Jakarta reached Rp 108.5 trillion. Until now, it is the highest achievement in Indonesia. "We want higher target this year, around Rp 110-120 trillion. Hopefully we can achieve it," he affirmed.